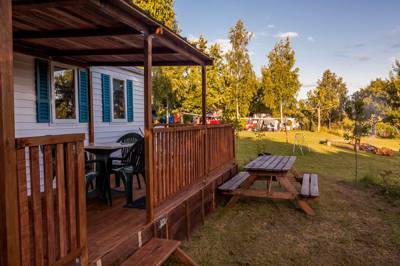 Active families will enjoy the great-value, easy glamping offered by stays in this mobile home in the Dordogne. The Mobile Homes are grouped together on the western periphery of the site. Sleeping up to four people, the mobiles have an open plan kitchen and dining area, covered terrace, bbq area and outdoor garden furniture for alfresco dining. The kitchen is equipped with a double hob, fridge and microwave and a combined dining nook. The master bedroom has a double bed (140cm x 190cm), the second bedroom has two single beds (80cm x 190cm). Pillows (square) and blankets are provided. Each mobile has its own shower room and basin etc with separate WC. BYO linen and towels or hire ours.